I was drawn to this book on first seeing it. It is beautifully illustrated and the whole design of it is really appealing. A quality looking book perfect for a gift. As you open the front cover straight away you see the first of the two cds, the other one is on the back cover - both have 50 songs on them. The cds just have one simple song after another. The voices are pleasant children's voices with basic accompaniment. Each devotion is set out with a song to listen to, a scripture, a picture, a prayer and a thought on the key word for that day. It's something that can definitely spur off extra conversation around the topic too. I love that the first one is on praise. 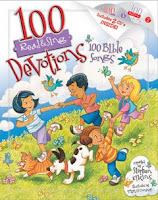 This is something really fun to do with younger children every day - a fantastic resource for parents wanting something Bible based to do daily with their kids to establish routines of having time to think about God and put Him first. You could easily use the key word to spur more thought or activity with them throughout the day to reinforce the topic and the songs just add to the memorability of it all. Highly recommend this.